I’m still doing this Debug Mode video game show thing! In fact, I’ve been working on content for the channel a lot lately. If my plans don’t get too derailed, 2019 should be the biggest year yet (which is to stay I plan on releasing more than 2 videos – hopefully many more than that). For now, here’s a look back at the games of 2018: the good, the disappointing, and my top 5 favorites. Happy New Year! Star Trek is ostensibly the kind of thing I should be really into. It’s nerdy, detail-driven science fiction more focused on ideas than action. It presents opportunities for a vast array of plots, characters, settings, and themes to be presented and explored. Reportedly, it has done those things and frequently done a good job. But I can’t get into it. I’ve never been able to. Every time I’ve tried to watch a Star Trek TV series I’ve come away with no desire to continue after an episode or two. The shows in actuality seem slow, boring, dumb, and inconsistent. I like three pieces of Star Trek fiction I have seen: The Wrath of Khan, Star Trek (2009), and The Next Generation episode “The Best of Both Worlds.” Everything else has bored me or insulted my intelligence. But Star Trek is such a mainstay of culture and especially nerd culture that I keep coming back to the idea of trying to watch it. And now, with the return of Star Trek to television (sort of), I figure this is as good a time as any to do a little experiment. 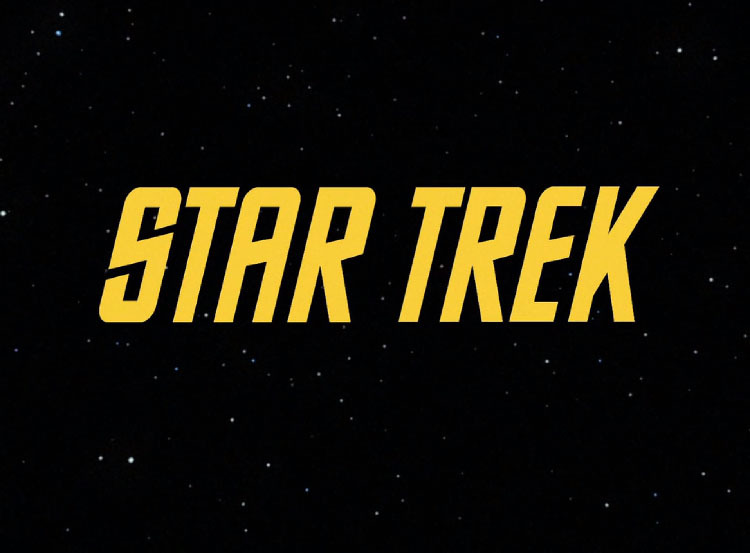 I am going to watch the pilot or first episode of each Star Trek series to see if any grab me this time around. Even if the actual episodes are still boring, comparing the different series of this vast and long running franchise should make for an fascinating trip through some television history. As the oldest Star Trek show, this one has aged the worst in many ways. The style and culture of the 60s are dripping from it. It’s colorful, boisterous, and self-assured. Despite being incredibly progressive with a diverse cast for its time, there’s still a palpable air of 60s misogyny about it. 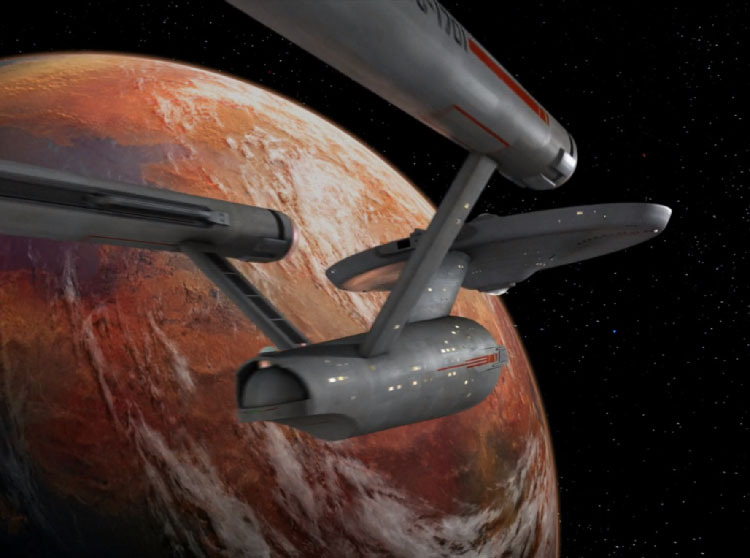 Looking at Star Trek with entirely modern sensibilities is probably wildly unfair. Clearly the show is special for its lasting impact and for the strides it did make in being more inclusive of minorities and other nationalities which is particularly notable in the midst of the civil rights movement and the Cold War. Its probably fairly sophisticated for 60s TV as well. A simple Google search of “1960s TV dramas” returns a list of names that are only vaguely recognizable to this millennial. I’ve heard of Perry Mason, The Avengers (a British spy show, not Marvels superhero team), The Wild Wild West, and Adam-12, but haven’t seen so much as a single clip from any of them. Other shows from the time like Mission Impossible, The Twilight Zone, and The Man from U.N.C.L.E. have all had recent reincarnations (or lasting influence on other series in the case of Twilight Zone). But none of those have had the staying power of Star Trek. None of them turned into a massive TV and film franchise on that level. 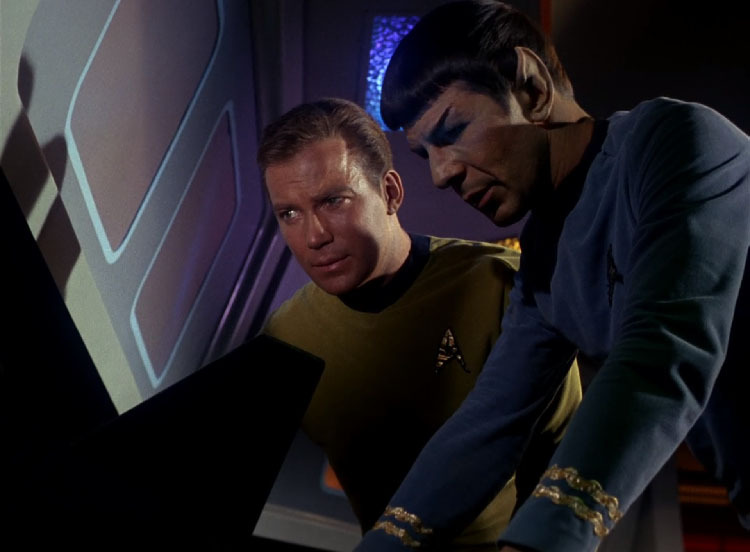 Finding the “first” or “pilot” episode of The Original Series (TOS) is a bit tricky. Technically “The Cage” is the original pilot of Star Trek. It was rejected for being “too cerebral” which makes me kind of curious to watch it. I’m dubious about what “too cerebral” meant back then. Even so, “The Cage” is listed on Netflix as the first episode of Star Trek which I have to imagine confuses a lot of people looking to experience the earliest adventures of Kirk and Spock. Kirk does not appear in that episode. The original protagonist of Star Trek was Captain Christopher Pike, but after the rejection of this pilot, the actor who played Pike dropped out. I thought about watching that episode instead since it’s the one that got the show greenlit. I actually did watch about 20 minutes before I got sick of the dumb ESP-related plot. Then I decided to view what’s broadly considered to be the “first” episode instead. People like to point out how Star Trek predicted cell phones. Pssh. 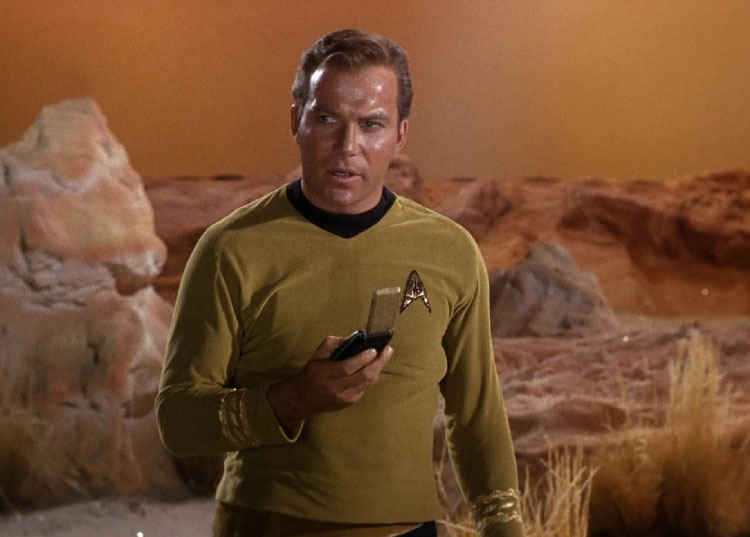 Kirk’s got a lame old flip phone there. Get with the times, Jim! This episode strikes me as pretty typical of the Original Series. There’s a strange, alien happening at the beginning of the episode which the characters gradually unravel through the rest of the runtime concluding with a fistfight or speech or both. One thing that’s extremely out of step with modern television is a lack of setup. “The Man Trap” doesn’t do anything special to introduce us to the characters or the concept of the show. The only explanation we’re given is the famous opening monologue that was present in every episode. Though I am no Trekkie, I could have written that from memory. It’s another iconic piece of the show. In this episode, Kirk, Dr. Leonard “Bones” McCoy, and the obligatory expendable crewman beam down to a planet to conduct a routine medical checkup of researchers Nancy and Robert Crater. Bones has a special interest in this mission as he used to be romantically involved with Nancy. The mission goes awry when the crewman ends up dead. Kirk, Spock, and Bones launch an investigation. They eventually discover that a shapeshifting alien disguised itself as Nancy and then several Enterprise crew members in a fight for survival. The creature is the last of its kind, but eventually they are forced to kill it after it threatens the lives of several crew members and Kirk himself. The plot itself is relatively uninteresting. I think it could have been more compelling to watch if the show had been directed differently. The audience knows far more than the characters know. We’re shown early on that the alien presents itself differently to Bones, Kirk, and the doomed crewman so we know something’s up. We aren’t solving a mystery with our characters, we’re waiting for them to catch up to what we already know. The director’s already showed us the answer. That’s a recipe for suspense rather than mystery, but I don’t think the suspense works for a modern audience. It’s hard to be truly concerned about the fate of any of these characters. We know Kirk, Bones, and Spock are all going to be fine though I supposed the original audience wouldn’t have the same assurance. It’s also become a well-known cliche that Star Trek would kill off otherwise unimportant crew members to heighten the stakes. Knowing this does a lot to dispel the illusion of danger. You can see the scriptwriter pulling the strings all too clearly. Regardless, the first half of the episode mostly works. It’s a decent setup and there’s ample opportunity for the leads to interact and show off their character traits. Kirk is a confident, charismatic leader who’s much less brash than pop culture’s collective memory has lead to me believe (granted, this is a tiny sample size). Bones is a soft-hearted, down-to-earth kind of guy. Spock demonstrates his perceptive intelligence and, of course, lack of overt emotion. The episode falls apart in the second half, however. There’s a hamfisted “moral” to the story. After being questioned, Robert Crater reveals that he’s known about the alien creature. It killed the real Nancy years ago, but since it was the last of its kind, he spared its life. He was content to let the creature play the part of Nancy as the next best thing. That’s super weird and creepy. Fortunately we aren’t given much time to think about that before Crater draws an absurd parallel between the creature and the buffalo. This is really funny now. The concept of species extinction must not have been commonly known because the word “extinct” is never used. The show literally has to explain it to the audience and thus to the “enlightened” 23rd century crew. You’d think explorers might understand that already. It doesn’t work as a parallel either. Buffalo (by which they mean American bison) aren’t extinct although it’s true that they were nearly hunted to extinction. It’s a touchpoint for the show’s audience, not for the show’s characters. I guess there’s supposed to be a message about conservation or something in there? It feels incredibly tacked on. Still, this was an example of how Star Trek would at least attempt to highlight social, political, and environmental concerns even if it didn’t always work. It’s also frustrating to watch our lead characters slowly catch on to what we already know. There’s a good scene where the ship’s officers are discussing what to do about the creature onboard and how they can find it. The creature is present at the meeting disguised as Bones. The real McCoy (ha!) was lured to sleep earlier by the alien in disguise as Nancy. I thought Kirk was catching on to fake Dr. McCoy in this scene. They kept cutting to his and Spock’s faces like they might know what’s up and I thought he was baiting the creature into revealing itself which would have been really clever. Actually, Kirk behaves rather stupidly in the end. Spock is assaulted by the creature. He tells Kirk that the alien was disguised as Bones. Kirk rushes to Dr. McCoy’s quarters knowing that he’s likely to find the creature there. Like a moron, he goes with no backup (not even a red shirt) and he nearly gets killed because of it. He only lives because Spock conveniently shows up at the last second. There are plenty of other silly details too. While it makes sense for a starship captain to lead the away team on diplomatic missions, it’s pretty silly that Kirk beams down with Bones and the crewman at the beginning for this “routine” medical mission. It would set a precedent for things to come – high-ranking officers regularly getting involved in mundane tasks that would spin out into larger adventures. Given that this was a TV show, I’m impressed by the effects for the time. Just two years later, 2001: A Space Odyssey would blow away everything that had come before it in terms of convincing space travel special effects. But TV has a much more constrained budget than feature films – especially features by high-profile directors like Stanley Kubrick. I hesitate to call the acting outright bad. It’s certainly dated. Sure, some of it seems outright poor. But acting sensibilities have changed a lot. Dramatic acting today tends to be a lot more naturalistic and subtle. I don’t think they were going for that back then. Nevertheless, I like the lead actors in their roles. Nimoy is great and judging by this episode, he was great as Spock from the very start. DeForest Kelley is charming as Dr. McCoy which goes a long way for a character that seemed to provide so much of the show’s soul and humanity. Whether William Shatner can act is somewhat controversial. I’ll simply say that he seems well cast and comes off as capable, and charismatic apart from the dumb decisions at the end of the episode. I like him in the role. 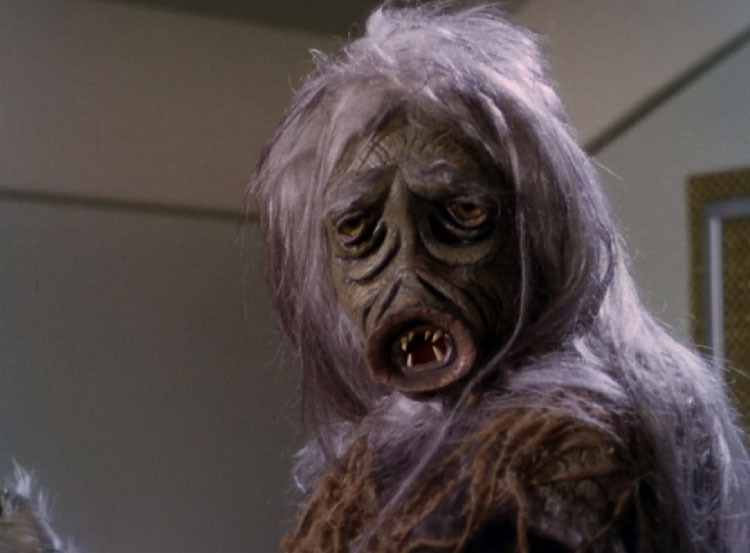 According to contemporary retrospectives, “The Man Trap” is one of the worst episodes of The Original Series. Dull and pointless as it was, I can still see why Star Trek became beloved. The Kirk/Spock/Bones dynamic really does work and, like I said at the outset, the concept of the show allows for all kinds of plots, characters, and themes to be explored. If it’s true that most of TOS is better than this, I may give select episodes a watch, but I have no intention of going front-to-back through the show. Unlike later series, TOS doesn’t have a ton of continuity to keep up with. I think its more episodic approach will allow me to pop in and out of the series at virtually any point and not be lost. The episodic approach is a double-edged sword. On one hand, shows that don’t leverage continuity can feel weightless without significant consequences from one episode to the next or one season to the next. On the other hand, the serial approach necessitates viewers wade through most, if not all the previous canon, to get the most out of the show. That’s a high barrier to entry. We’ll talk about that next time. It’s been a while since I made a Debug Mode video. In fact, I got all the way through 2016 without producing one even though I intended to do so. I still have a bunch of ideas kicking around for topics. I want to move away from “reviews” like I’ve done in the past and talk more about concepts or specific aspects of games I find interesting. 2016 had so many great games. I wanted to comment on my favorites. So this is still more review-ish than I will probably do in the future, but I’m fairly happy with the way it turned out. And it’s a list, of course. People like lists. I like lists. Lists are fun. Psychology, eh? Well it took much longer to get this out than I wanted. It would have been released sooner if not for a few personal and professional matters that delayed things. And also that fight with the printer. Yeah, that story was about me trying to print the script for this video. I have a lot of ideas for future Debug Mode videos: games I want to talk about and topical videos too. I’m even contemplating covering some movies or TV shows. I’ve got a lot of partially written scripts. A lot of footage captured. 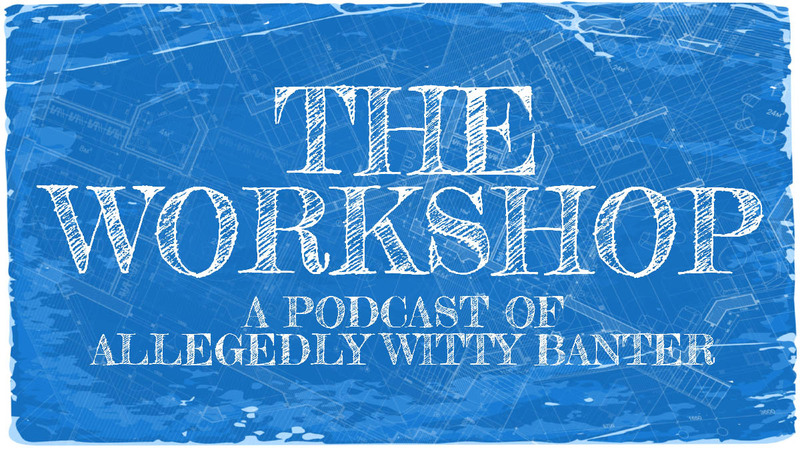 I was working on a completely different subject but then Cities: Skylines came along and I knew I had to cover it. As a longtime SimCity fan, I was super disappointed by the 2013 entry in that series and Cities: Skylines is this amazing game because it fixes nearly everything that the other game got wrong.